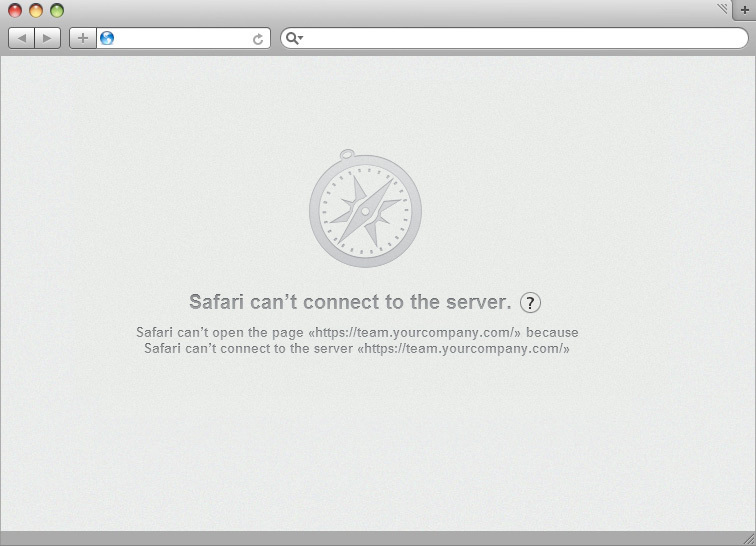 If you have managed to find and solve the issues, TeamWox login page will appear. Otherwise, contact your system administrator or our TeamWox customer support team. This is a quite typical issue during the first attempt to log in TeamWox Groupware. 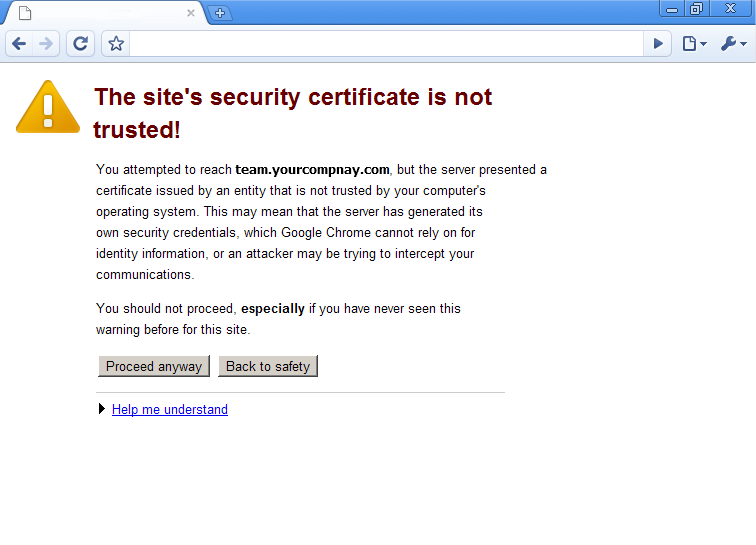 The reason is that you connect to the system like to a web site with a high security level. 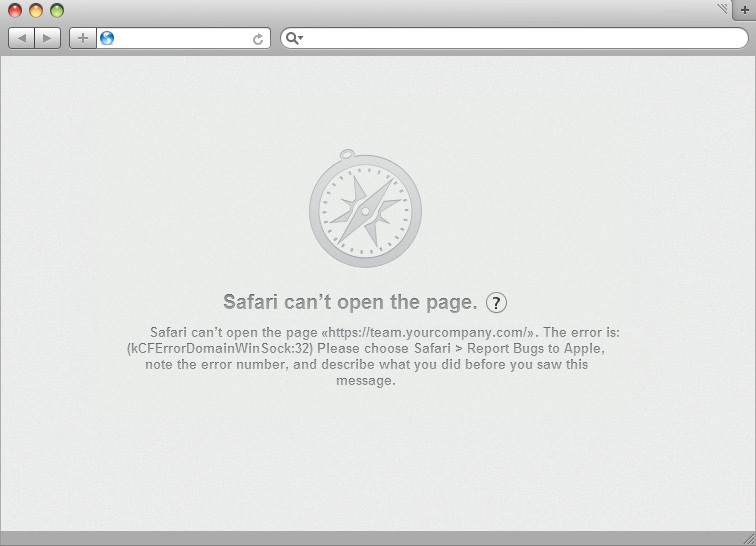 Depending on your web browser, you may see a blank page, domain connection error message, inability to open the web page or connect to TeamWox server warning. Web browsers react differently and usually do not specify the problem. In this case we recommend you check the proxy server configuration, workplace network environment and the status of your TeamWox server. Open the Options menu > Options > Advanced > Network > Settings, enter your TeamWox domain name (for example, "team.yourcompany.com" - "https://" is not required in this case) in the "No Proxy for" field. Open the Tools menu > Internet Options > Connections > LAN Settings > Advanced, enter your TeamWox domain name (for example, "team.yourcompany.com" - "https://" is not required in this case) in the "Exceptions" field. 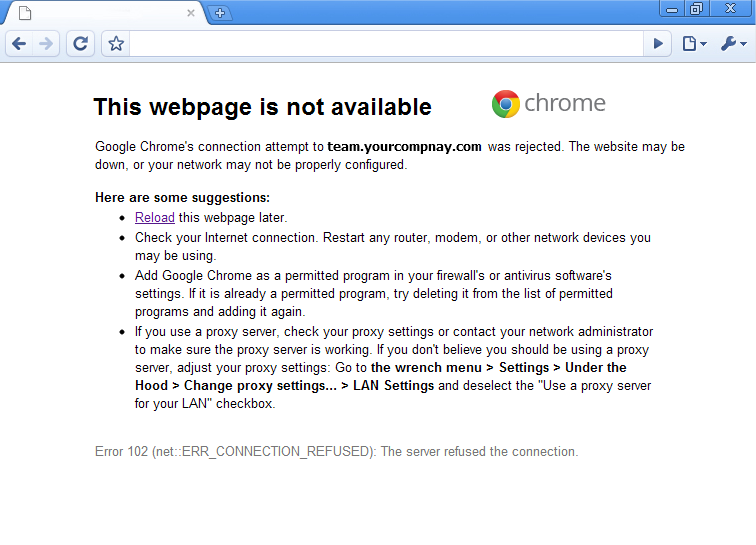 Open the Settings menu > Under the Hood > Network > Change proxy settings... > Connections > LAN Settings > Advanced, enter your TeamWox domain name (for example, "team.yourcompany.com" - "https://" is not required in this case) in the "Exceptions" field. 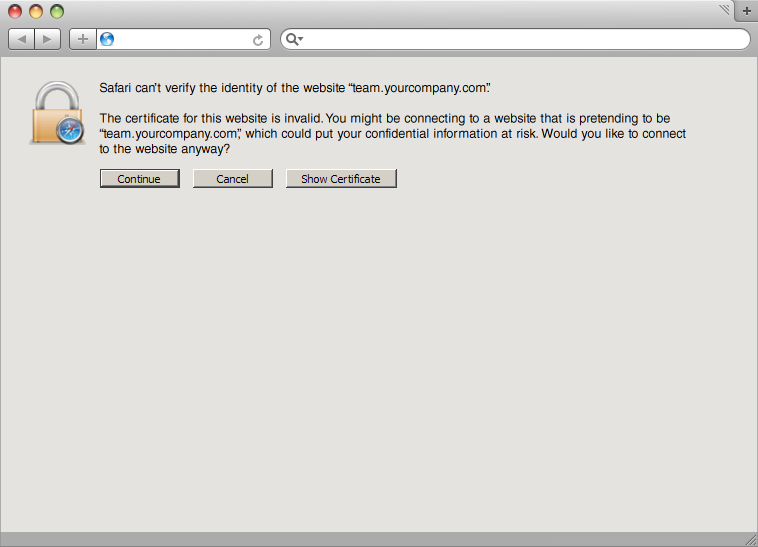 Open the Preferences menu > Advanced > Proxies: Change settings... > Connections > LAN Settings > Advanced, enter your TeamWox domain name (for example, "team.yourcompany.com" - "https://" is not required in this case) in the "Exceptions" field. Open the Menu > Settings > Preferences > Advanced > Network > Proxy servers... > Exception List, enter your TeamWox domain name (for example, "team.yourcompany.com" - "https://" is not required in this case) in the "Use proxy for all servers except those on the list" field. 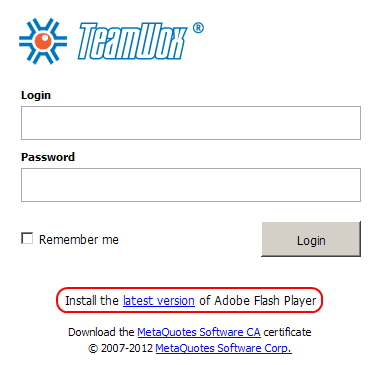 Save your changes and try to open TeamWox system login page again. If the page has not appeared, then your workplace needs to be configured further on. Execute the following steps to eliminate all possible issues concerning the access to TeamWox collaboration system. 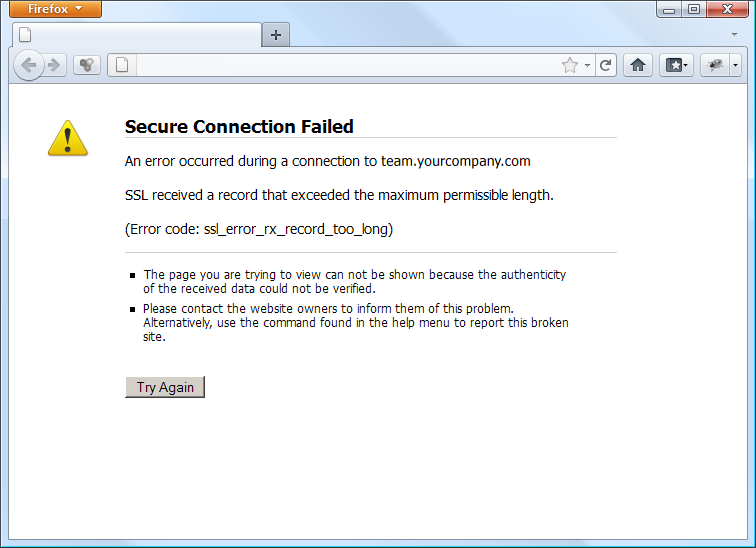 If you see the message that it is impossible to find the host (team.yourcompany.com in our case), then the specified domain name is not associated with the computer IP address. 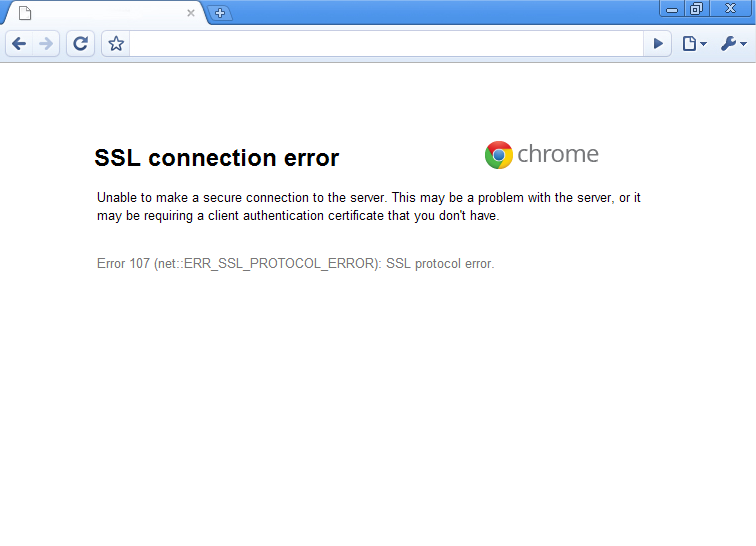 This means that DNS is not working properly. Contact your system administrator or hosting provider to configure it. In case DNS setup is impossible for some reasons, the issue may be solved by editing the hosts file on your computer. In this case, check Internet status at your workplace. 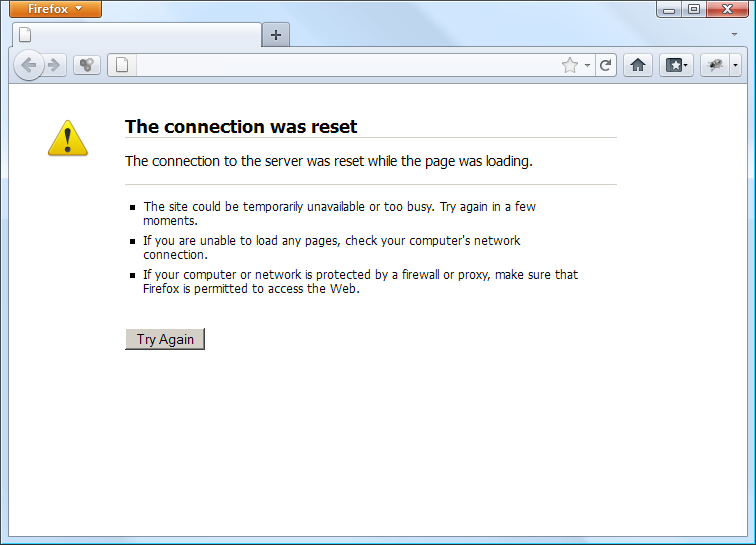 Try to open other web sites in your web browser. 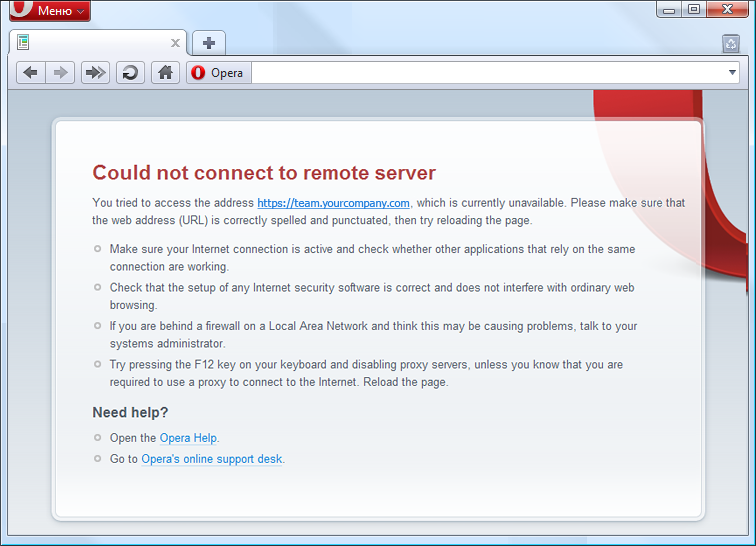 If they are unavailable, your Internet access is not configured properly. Contact your system administrator or Internet provider to solve the issue. If you have the Internet access from your workplace, then you need to check the status of the remote access to TeamWox Groupware system. This can be done by TeamWox system administrator. So, contact him/her for help. In this case the issue is most probably connected with the domain system configuration and the IP address assignment to the TeamWox server domain. Ask your system administrator to check DNS operation and fix the issue. If there is no such possibility, you can solve the issue yourself by editing the hosts file on your computer. If the IP address is assigned to the domain name correctly but the issue remains, it means that your TeamWox Groupware server has not been launched or has been disabled. In that case, only your system administrator can solve the issue. He/she needs to check TeamWox service operation. The hosts file acts as a local DNS and assigns a domain name with a computer IP address. 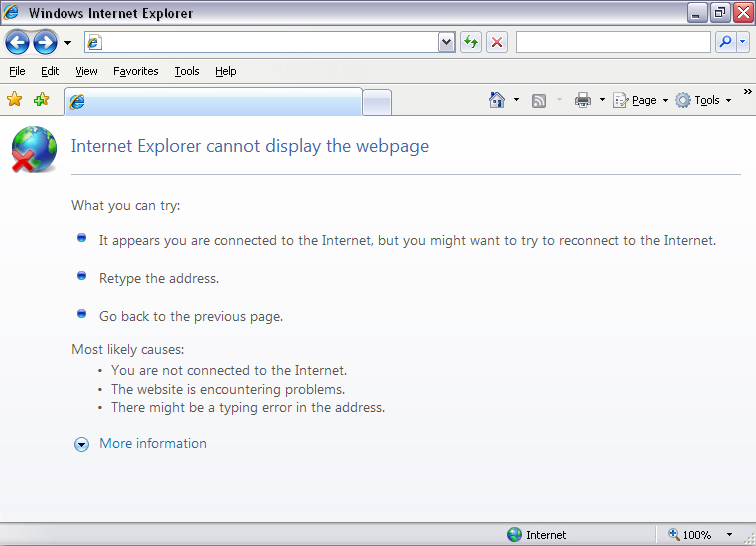 That allows a web browser to connect the computer at the specified IP address. The hosts file editing is used only as a temporary solution, as it works only for one workplace. Besides, the hosts file must also be edited when changing the IP address for the specified domain. Check the IP address of the computer with the installed TeamWox Groupware server before editing the hosts file. To do this, type "cmd" in your computer's command line (Start -> Run -> Open) and enter "ping [TeamWox server domain name]" (for example, "ping team.yourcompany.com") in the new window. As a result, you will see the IP address of the following format 217.67.42.172. If you use Windows Vista or 7, you will need Administrator rights to make changes to the file. To do this, open Start -> All Programs -> Accessories -> right-click on Notepad and select "Run as administrator". Then open the hosts file for editing via the Notepad. where 217.67.42.172 is the IP address of the computer with the installed TeamWox server that you have received using ping command. Finally, save your changes to the hosts file and close it. Now, try to open TeamWox login page again. If your attempt has failed, then your workplace needs to be configured further on. Execute the following steps to eliminate all possible issues concerning the access to the TeamWox collaboration system. This issue occurs when one port is used by several programs simultaneously. 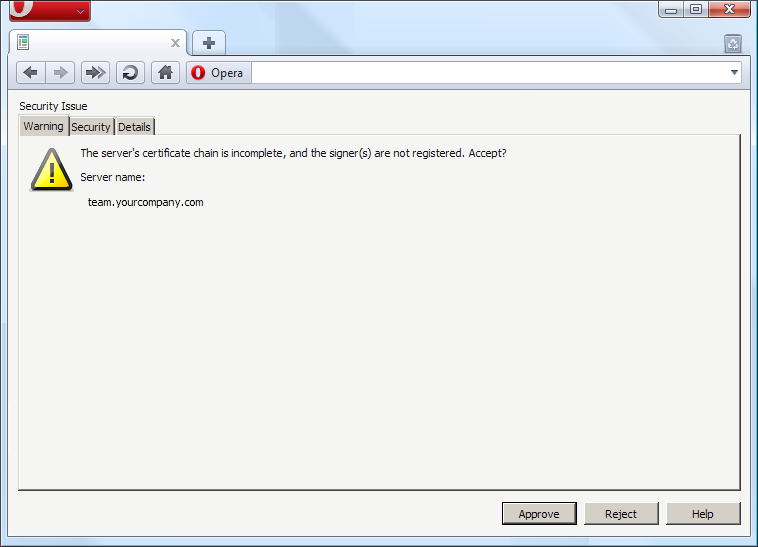 In particular, the ports 443 (https) and 80 (http) must be used for TeamWox server operation. If they are not available, you will not be able to connect to the system. 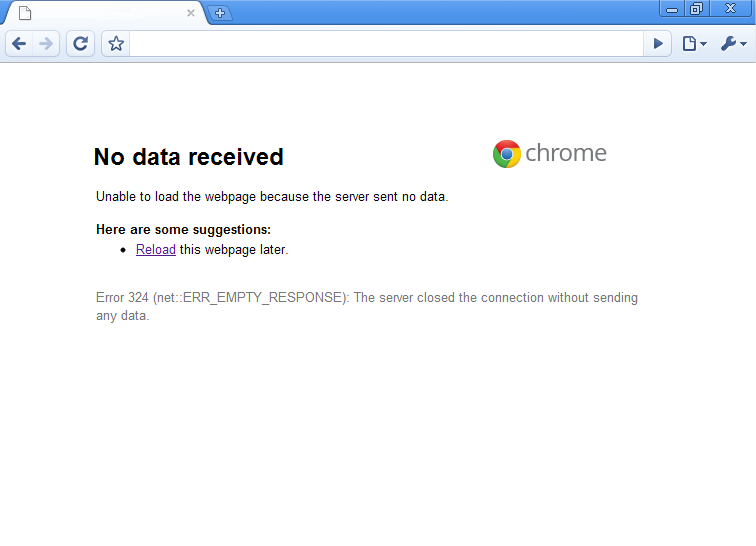 In that case, please, inform TeamWox administrator about the blocked server ports issue. 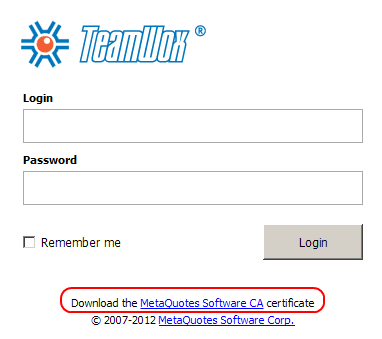 You will see "Download the MetaQuotes Software Root CA certificate" at the bottom of the page. 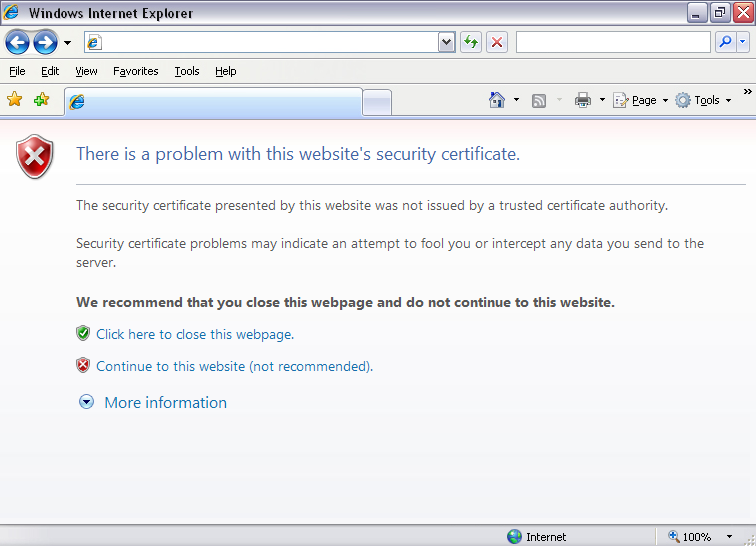 This means that information about MetaQuotes Software CA has not been added to the list of trusted certification centers on your computer yet. Therefore, your web browser already trusts the root certificate accepted as an exception, while your operation system does not trust it yet. As a result, some TeamWox system features may not be available to you. For example, you will not be able to connect to TeamWox system via WebDAV protocol. Also, there may be difficulties in using Drag&Drop tool and uploading files on the TeamWox Groupware server. Later you will be able to get your own SSL certificate from the authorized certification center to replace the previous one issued by MetaQuotes Software Corp. certification center. 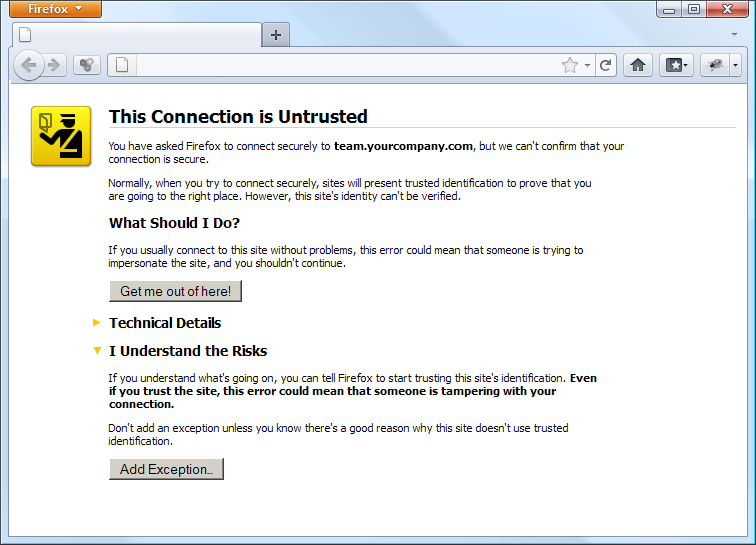 After that web browsers will no longer show the untrusted certificate warning messages regardless of the used workplace. Download the latest version of Adobe Flash Player plug-in. Close your running web browser before the installation. Start the installation process, and after its completion you will be able to continue your work in the TeamWox system without any limitations. After the TeamWox login page has appeared, the workplace setup process is complete. Log in TeamWox system and start working in it. For your convenience, we have prepared the brief training course for TeamWox users. You can save your TeamWox address as your web browser's home page to simplify your work. WebDAV access setup will facilitate and speed up the work with documents in TeamWox business management system. This technology allows to connect the files storage in the "Documents" module as a network folder on your computer. You will be able to work with files in TeamWox Groupware as easily as if they were on your computer. If you have any difficulties in setting up your workplace, contact our TeamWox customer support team. Qualified staff will help you in setting up a workplace and TeamWox Groupware server installation.